CP + 2018 was held at Pacifico Yokohama and surrounding venues from March 1, 2010 (Thursday) to March 4 (Sun). As previously reported, the total number of visitors for 4 days was 68,111, the highest number ever. The number of visitors on Saturdays and Sundays exceeded the previous year, totaling 102.2% compared to the previous year. 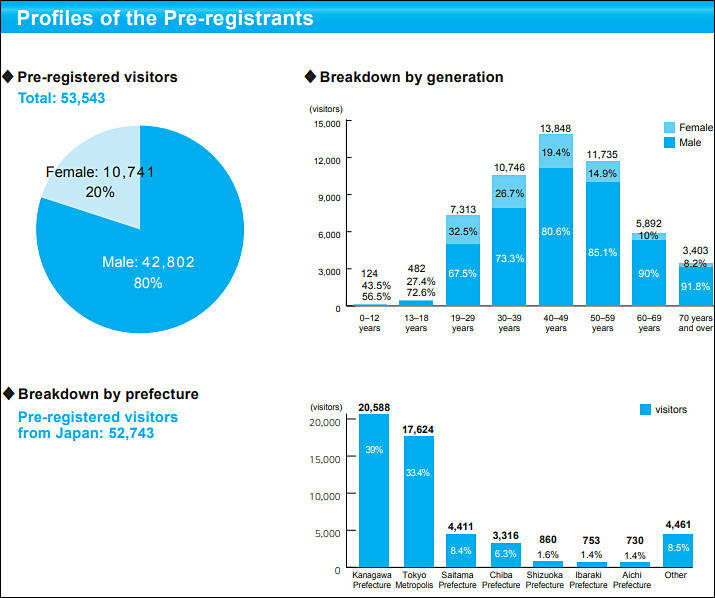 According to the pre-registrant profile, out of 53,543 people who made web pre-registration of CP + 2018 (entrance is free), male-female ratio is 80% for males and 20% females (same for actual visitor profile) . The breakdown by age shows maximum of "40 to 49 years old" (13,848 people). Both have the same trend as the report of CP + 2017. "Are you with anyone?" questions results are - "One person" (67%), "With friend or company colleague" (23%), "With my husband or wife" (9%), this also had the same trend as last year. In the response to question "Please let me know if you would like to come to CP + in the future", the answer "I would definitely come next year" increased from 60% of last year to 64%. CP + 2019 is scheduled to be held at Pacifico Yokohama and neighboring venues from 28th (Thu) to 3rd (Sun) of 2019.